Posted on Thu, Dec 16, 2010 : 1:11 p.m. Exposure to BPA — a common chemical used in re-usable water bottles and the protective lining of metal food and beverage cans — may compromise the quality of a woman’s eggs, according to a small-scale study from the University of California, San Francisco. Bisphenol A (BPA) makes plastic hard and clear and is used in thousands of consumer products. The study of 26 women undergoing in vitro fertilization suggests fertility levels of women with higher blood levels of BPA decreased the percentage of fertilized eggs by 50 percent, according to the research team. 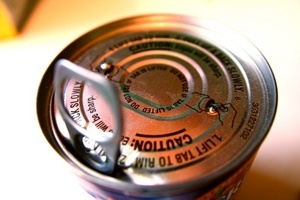 BPA, a chemical used in thousands of consumer products, such as the lining of metal food cans, has been targeted for reducing egg quality in women. The study may have been small, but the findings are a big concern, study authors said. Michael S. Bloom, an assistant professor in the departments of environment at the University of Albany, State University of New York, said BPA exposure in the U.S. is widespread; a 2004 Centers for Disease Control and Prevention study found BPA in the urine of nearly everyone tested. The researchers' findings are published online in the journal Fertility and Sterility. BPA has captured global attention as an environmental contaminant and endocrine-disrupting properties, researchers said. UCSF launched an online resource called Toxic Matters aimed at helping consumers make smarter decisions about substances that can harm reproductive and general health. Locally, the Ecology Center has taken on toxicity with its site, HealthyStuff.org, which takes aim at toxic chemicals in everyday products. A recent University of Michigan study suggested a link between BPA exposure and an increase in allergies in children. Another U-M study linked decreased sperm quality to BPA. Yet more research theorized widespread BPA exposure is a contributing factor to girls hitting puberty earlier in the United States.